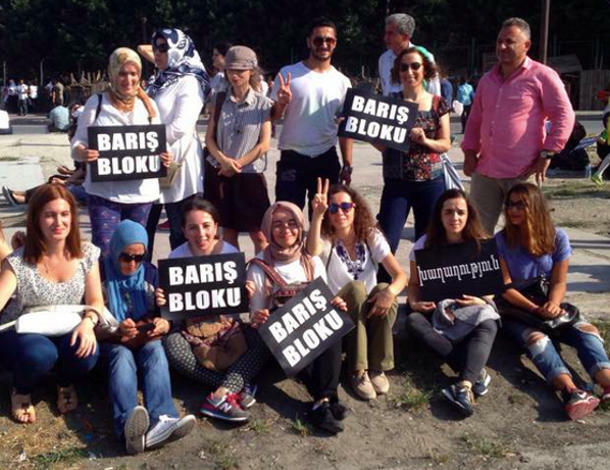 On 20 July 2015, the international community was shaken by the news of the murder of 31 civil society activists, many of whom were women human rights defenders (WHRDs) in the predominantly Kurdish city of Suruç in Turkey. The activists were on their way to rebuild the war torn Kurdish city of Kobane in Northern Syria, carrying toys and books for orphaned children. Although the attacks were attributed to the self-proclaimed “Islamic State of Iraq and the Levant” (ISIL), many point to the government of Turkey’s complicity in the bombing of activists to curb peaceful advocacy in solidarity with Kurdish minorities of the region. The assassination of the WHRDs at Suruç took place almost one year after the poignant intervention by Iraqi Ezidi MP Vian Dakhil on abuses committed against Ezidi women and girls by ISIL. It is worrying to observe violence targeting women in the region has escalated since Dakhil’s call. Despite ongoing challenges and organised violence, Kurdish WHRDs continue to develop new strategies to tackle oppression by governments and violent non-state actors. AWID spoke with five Kurdish women activists to learn more about their experiences of defending Kurdish women’s rights, and to analyze the challenges and opportunities for the struggle in Iraq, Turkey and Syria. In recent years, there has been a considerable increase in the visibility of the Kurdish struggle in Turkey and Syria; yet, media attention on Kurdish women has mostly focused on their engagement in armed combat against ISIL. This has unfortunately obscured the multiple dimensions of Kurdish women’s activism and limits understanding of their meaningful involvement in conflict resolution and advancement of human rights. Kurdish women human rights defenders have greatly contributed to the fight for the minority rights of Kurdish people and for gender equality in Kurdistan, in a climate marked by a number of challenges but, above all, new opportunities. According to Kilic, Kurdish women were not only mobilized socially and through organized civil society, but also in the Armed Front of the struggle for Kurdistan’s liberation, and very quickly became critical of the models upon which military organizations are structured. Within the liberation movement, Kurdish women militants were fighting equally against the patriarchal system and wanted to guarantee equality between women and men at all levels of decision-making. “It was an ongoing struggle against the masculine ranks of patriarchy in the community and in the political arena. Kurdish women activists also questioned the place of religious fundamentalisms, which became embedded into society by the manipulation of beliefs by State forces. The autonomous democratic system that they are promoting is the critique and antithesis of all existing monopolistic structures,” adds Kilic. Despite ongoing challenges, the Kurdish struggle has produced alternative models of governance, putting democracy and human rights at the heart of policy making. For the past three years, the Kurdish liberation movement has been developing a political model for the control and self defense of the Rojava region in Syria, based on principles of direct democracy, community organizing, gender equality and respect for diverse identities. Within this system, women are represented as equals, from municipalities to citizen’s assemblies and peoples’ self defense forces. “Women from Rojava are thus the carriers of a new social contract with innovative values,” explains Kilic. This social contract, adopted in January 2014 to proclaim the autonomy of Rojava, refers to the values of gender equality, mandatory and free access to primary education for all, collective rights (including maternity leave), respect for diverse identities, secularism, shared representation among authorities (with at least 40% of men or women across all institutions) and local self-governance of the three cantons that make up Syrian Kurdistan. The Suruç attacks are a serious cause for concern for those working for peace building and conflict resolution in the Middle East. The level of intimidation against Kurdish activists was further escalated by Turkey’s responding with military operations targeting Kurdish armed groups in northern Syria. Therefore, both the attack itself and the militarized response has undoubtedly had negative effects on establishing a conducive environment for human rights advocacy and peace building in the region. Some connections have therefore been promoted among Kurdish WHRDs in the region, as a way to strengthen cohesion and the exchange of experiences and strategies between them. Last May, the Iraqi al-Amal Association held a major regional conference addressing the role of women standing against extremism and militarism, explains Ali. Activism for the recognition of human rights in the region have been carried out courageously by Kurdish women. However, they are at a critical juncture, facing momentous threats both from governments and violent non-state actors. Under such an environment they remain hopeful that their committed struggle will not only pioneer peace and human rights for their own communities, but all communities of the Middle East. Read Selin Girit, “Suruc massacre highlights Turkey's Islamic State dilemma”, BBC News, 21 July 2015. With the exception of Iranian Kurdistan. Read David Graeber, “Why is the world ignoring the revolutionary Kurds in Syria?”, The Guardian, 8 October 2014. In addition to the Kurdish population, Rojava includes Arab, Assyrian, Chaldean, Aramaean, Turkmen, Armenian and Chechen populations.